he Signal Hill Tattoo is an internationally known award winning historical animation program. 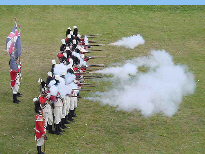 Each summer, audiences thrill to the echo of the cannon, mortars and musket fire combined with the stirring tunes of the Fife and Drum Band which beckons visitors to a bygone age of 19th Century British military might. Set atop famous Signal Hill, the Tattoo portrays the garrison life and duties of His Majesty’s Royal Newfoundland Regiment of Foot and the 27th Company-2nd Battalion-Royal Regiment of Artillery who endured the harsh conditions of the Newfoundland Station in the late 1790’s. Since its inception in 1967, thousands of young men and women have profited greatly from the military training they received as members of the Signal Hill Tattoo Historical Animation Program. More importantly, these same people have contributed in great measure to their own communities from attributes instilled through Tattoo training in leadership, citizenship and community involvement. Each summer upwards of sixty five young men and women of high school age are employed and undertake an intensive training program in the military tactics of a British Infantry Regiment. 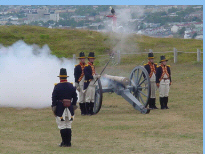 Commencing in early July, the Signal Hill Tattoo is held each Wednesday, Thursday, Saturday and Sunday and features a military extravaganza of 18th century British linear military maneuvers. The Signal Hill Tattoo has won numerous awards including the coveted Canadian Heritage Award, the City of St. John’s Tourism Event of the Year Award, the Historic Sites Association of Newfoundland and Labrador Manning Award, and has been twice named to the Top 100 Tourist Attractions in North America by the American Bus Association. 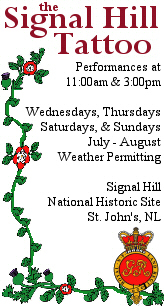 The Signal Hill Tattoo is recognized as a 'must see' tourist attraction and is the first presentation of choice for Newfoundland families hosting family or friends from away. The Tattoo has traveled throughout the Province participating in various community events and has performed for numerous dignitaries including Her Majesty Queen Elizabeth II, the Prime Minister, and several Canadian Governor Generals. The Signal Hill Tattoo has a strong commitment to commemorating our Province’s rich military history. The Signal Hill Military Tattoo was first performed in 1967 as a local project in celebration of Canada's Centennial year. With the exception of a three year lapse from 1967-1971, the Tattoo performances have been a summer tradition in St. John's. The Signal Hill Tattoo is performed each summer on O’Flaherty Field, one of the sites where defenses were erected during the War of the Spanish Succession (1702-1713). This war resulted in the withdrawal of French troops from Placentia and the establishment of Fortress Louisbourg - and the Seven Years War (1756-1763) - which ended forever the danger of French attack in North America. The Signal Hill Tattoo runs from July 1 until mid-August, and performs on O'Flaherty Field on Wednesdays, Thursdays, Saturdays, and Sundays at 11:00am and 3:00pm (weather permitting). 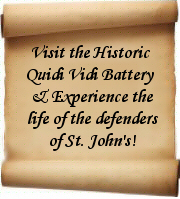 For directions to the Signal Hill National Historic Site, click here.